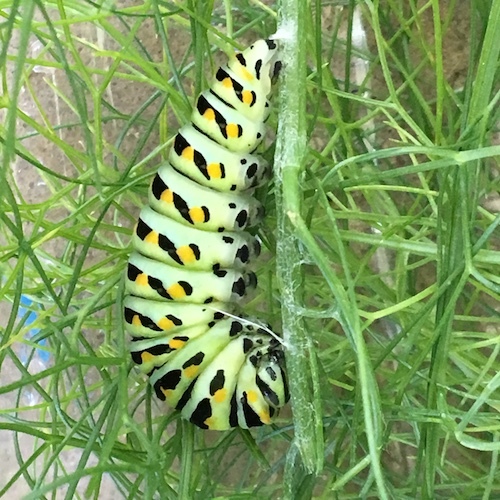 If you follow me on Instagram, You may be following along with the growth of my backyard Eastern Black Swallowtail caterpillars. I love to observe the life of the caterpillar and its metamorphosis into butterfly. 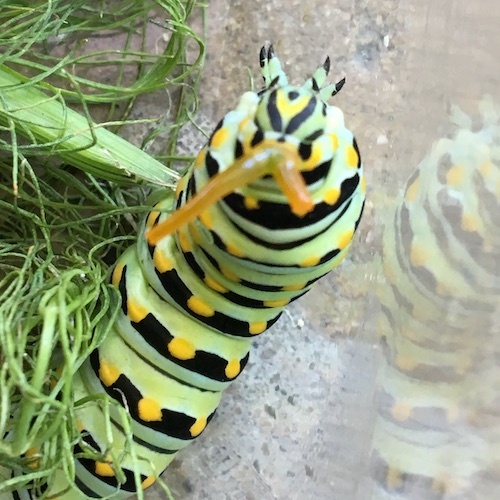 It’s full of slow paced action (eating and pooping), mystery (when will they go into chrysalis), suspense (when will the chrysalis hatch), and finally release! Today on the blog, stroll through.. 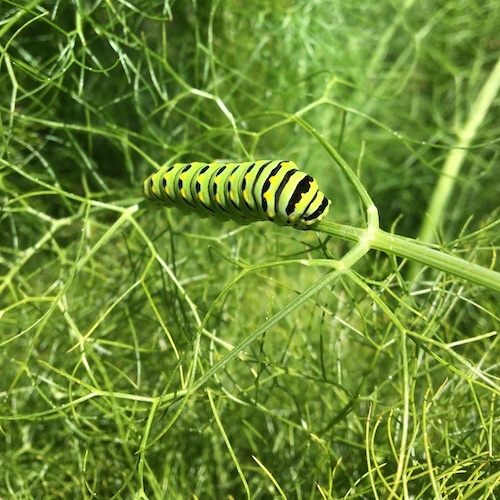 It all starts very small once the caterpillar hatches onto it’s host plant, in the case of the eastern swallowtail, fennel or parsley. 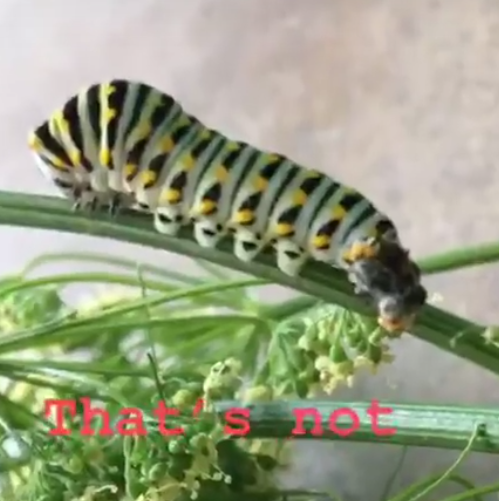 The day old swallowtail is only a couple centimeters long at biggest and looks a lot more like a bit of dirt on the plant than a creature. In the next day it will eat and about double in size, looking more like bird poop from a distance. 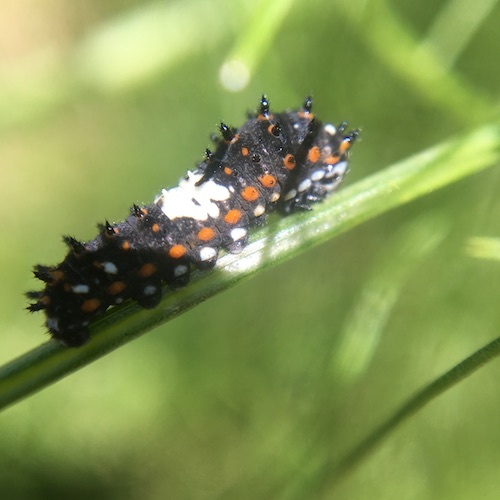 These tiny caterpillars in the first days of life use this type or mimicry as a defense against predators. After a couple days, the caterpillar will shed it’s skin and begin to develop it’s stripes. Notice how at this point, the caterpillar retains some of it’s spikes to ward off predators. It’s tiny feet help it grab on to the plant and grab the ends of the tender leaves to eat. They will bend completely backwards in half to eat sometimes even. Once they have grown to the striped stage, they also develop their defense mechanism – stink horns. If they become aggravated and need to warn off danger, they send out these “horns” that emit a very strong stinky smell – a very big smell for such a small creature! It’s amazing how creature so small can eat and poop so much – just like human babies! 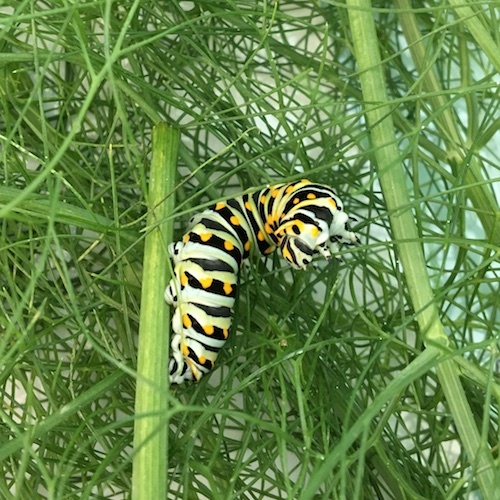 By about day 5, the caterpillar will only change it’s size, not it’s look, until it goes into chrysalis. From here on out, for about the next 5 days it spends its life eating, pooping, growing, and resting. 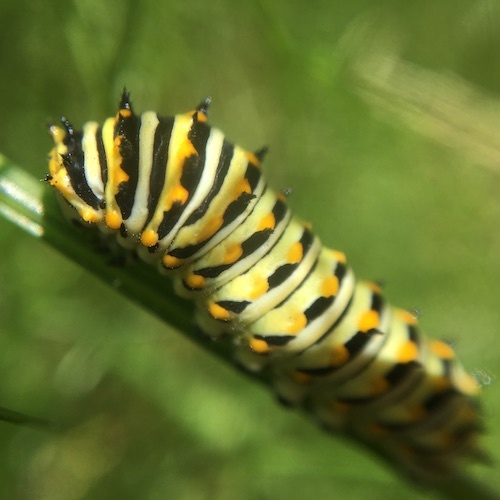 The different stages of the caterpillar are called instars. They go through 5; see 3 in the pic above. They don’t even really sleep and must be provided a constant fresh supply of their host plant if you are growing them off the plant to protect them from predators. They can be a little high maintenance at this full stripe constant eating stage if you are growing them in containers, but they are fun to tend to. These 3 in the pic above are, on average, days 4, 6, and 8. They are ravenous at this final stage. 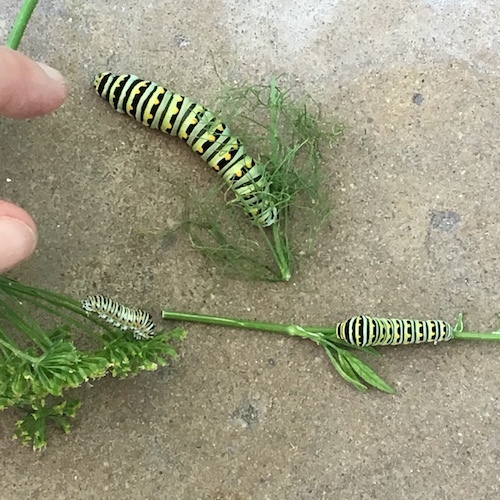 They must eat enough to supply them the energy to go into chrysalis and turn into a butterfly. There is no need to fear for your plant though. 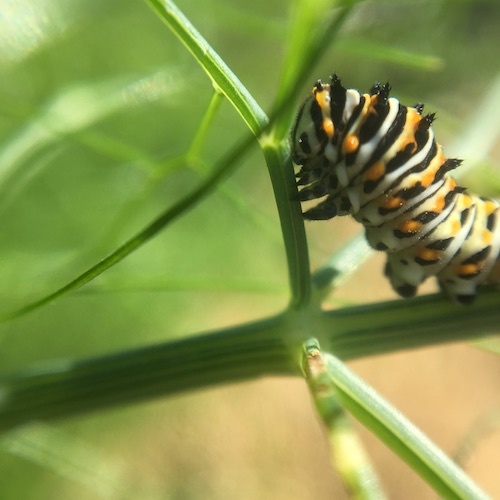 If a particular plant has been eaten to the maximum it can stand for it’s own survival, it will release a hormone that signals the caterpillars to move to a new plant. Nature’s checks and balances are amazing! After approximately 10 days, the caterpillar will make a “J” shape, attach itself with silk and begin metamorphosis. 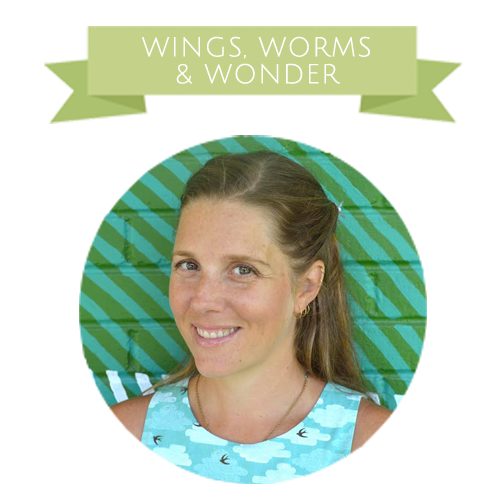 It’s a slow paced, full time journey the caterpillar makes from egg to chrysalis, and a journey I’d recommend taking if you have the chance! 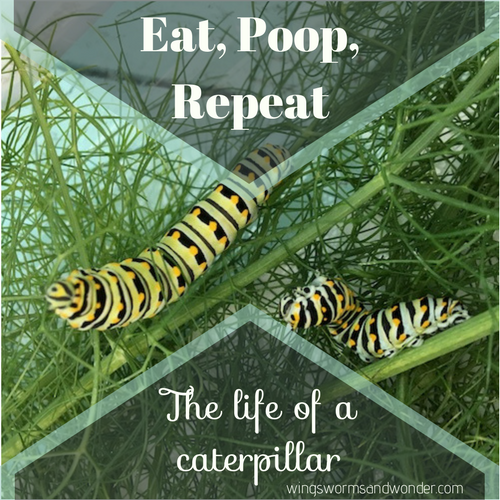 Have you ever raised caterpillars? If so, what type and did you enjoy it? STAY TUNED! & Be sure you’re subscribed to the newsletter to know when it’s available! 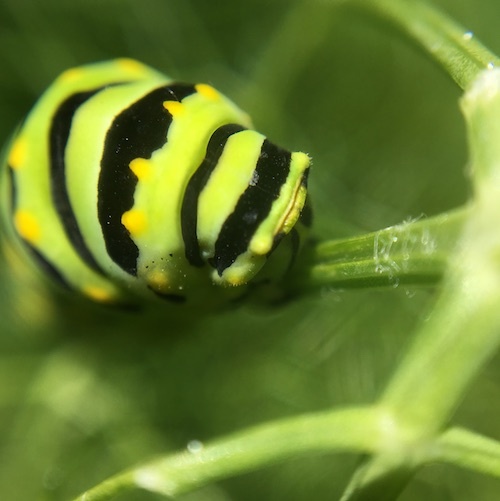 Eastern Swallowtail caterpillars are often confused for Monarch caterpillars because of their stripes. Learn how to tell the difference here.